Populated the city on the sphere. Next I'll work on materials, but I might take a break to work on music, trying to put the finishing touches on two songs that I'm really excited about. It would be nice if tigsource could embed Soundcloud. Tomorrow we have our second day of MIT's Advance Game Studio (MIT GameLab), therefore we are trying to push to have a working prototype with the new code and environment. Something we haven't discussed on here yet that has been an important part of this project is the player controls. We are currently on our third iteration of the player controls. For the first build we used animations as character controls. We found this made play testing extremely difficult, any time we found that a character wasn't quite platforming the way we had hoped, we would have to modify the animation, leading to a long production process. Our second build used a physics based character control. 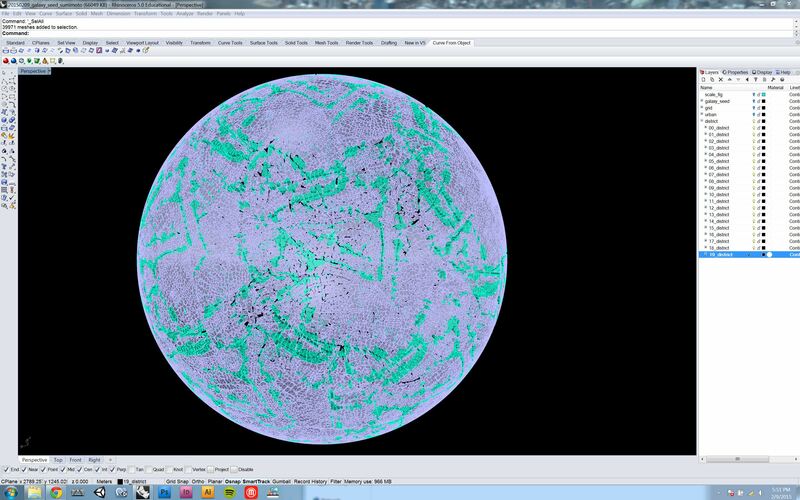 Again, this caused lots of small issues (although it was a lot better than the animation control), when the gravity is wonky because of our sphere there was a lot of glitching. For our third, and likely final player control we are using the transform function. As architects we have a lot of experience with geometry, coordinates, etc. so this makes a lot of sense for us and we feel like noobs for not going straight for it from the beginning. This has allowed us to change character attributes and play test a lot more effectively as well as being smoothing and optimizing the game even more. Now we can focus on the fun stuff. Dude this is art!!!! My Word! I'm assuming since everyone is on the internet they are aware of the massive amounts of snow New England has been receiving, keeping indoors much to my disma. My trepidation is your good fortune, the winter blues have allowed me to cook up some warm beats to keep the cold away. Enjoy! 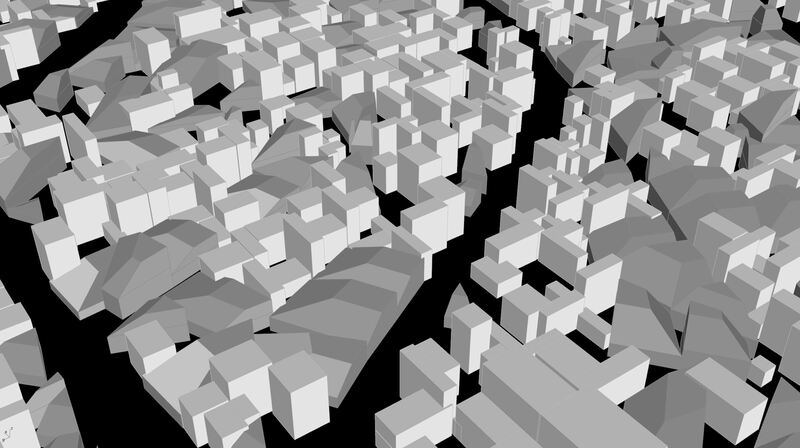 New city is in unity, working on optimizing it, occlusion culling is amazing as always! 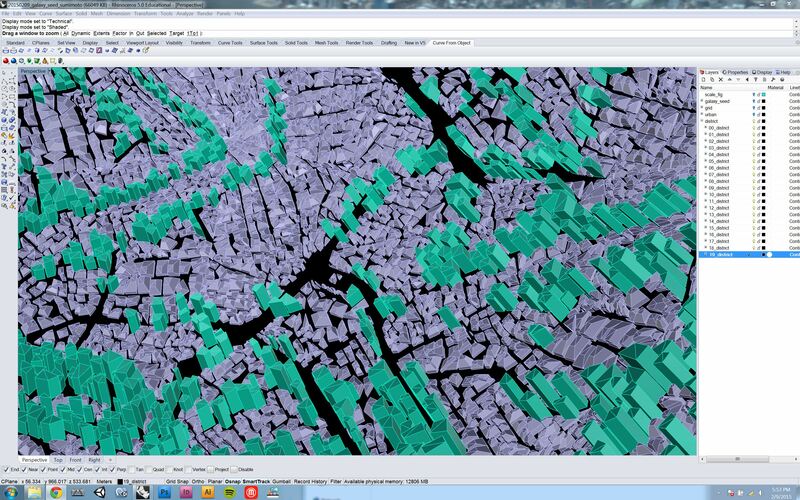 I really need to find a way to show a comparison between the new and old cities, this one is soooo much bigger. Alright, so I think it’s time to join this thread now that Archgame has built the foundation. I’m the other half of the HomeMake team. We’ve separated our skills out to various aspects of the game. 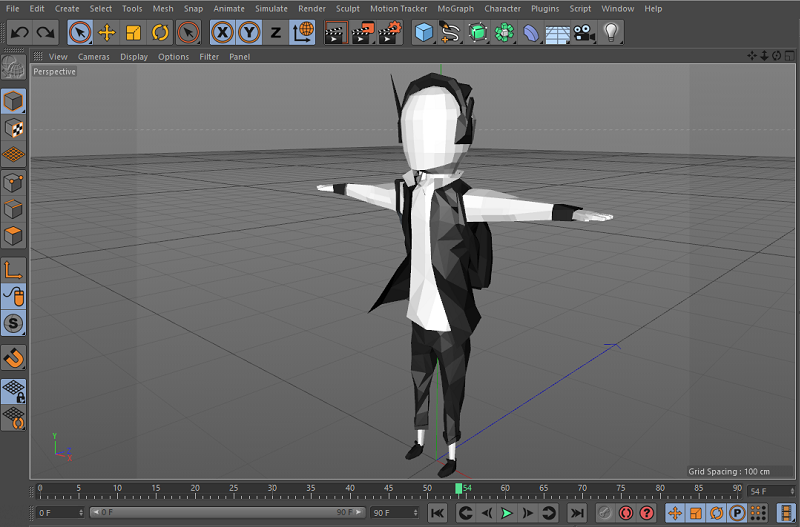 My main focus is character design, animation, game assets, and narrative. This first post I just wanted to start catching up on all the characters in the game be more transparent with their development. We showed Iso earlier but below is his current iteration. He hasn’t changed much as you can see. Iso was our very first character and as a result has gone through a number proportion changes and small tweaks in order to hone in on the general theme of the characters we’re after. His size/shape/dimensions have been our general point of reference for the other character’s starting points. He still has some more changes in design and animation with more optimization still to come but I’m happy with his current form. 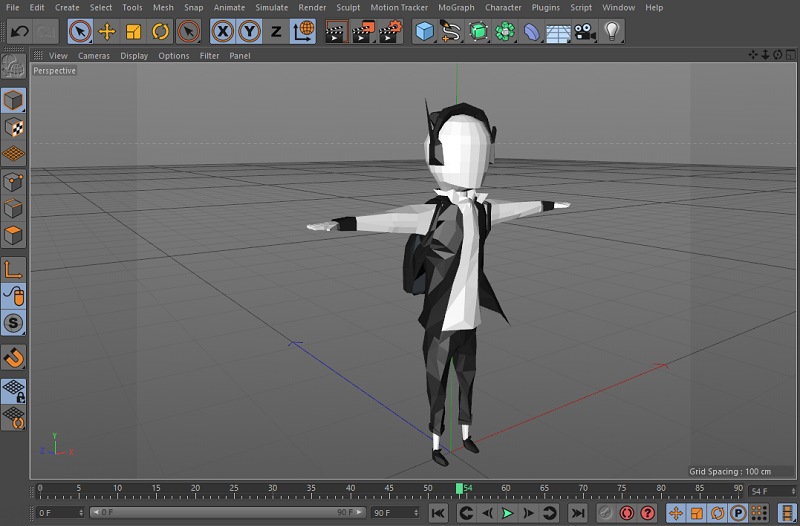 Right now I’m currently in the process of redoing his animations (time to get rid of those stock unity animations!) to give him a little bit more flavor. More to come once we get him (back) in game! Hey man! Good to hear from you again. Thanks for the kind words. We should plan another gaming session soon after a major milestone. Last time was most excellent. Regarding dev stuff. 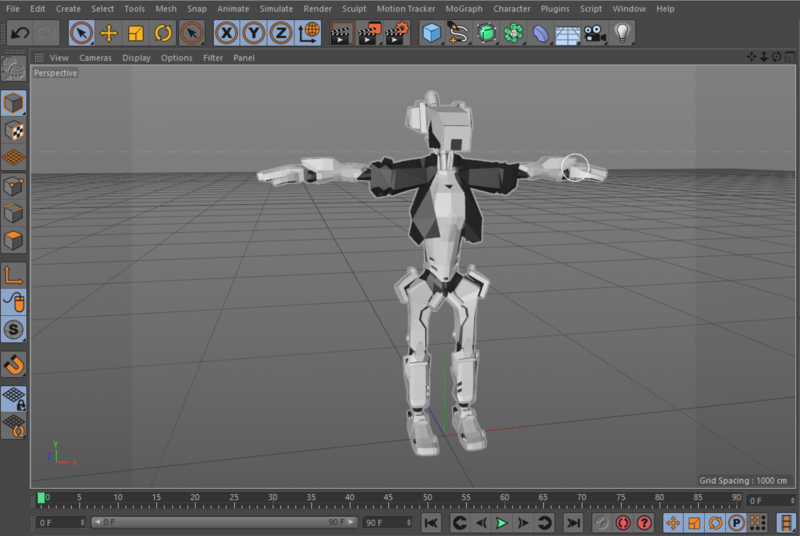 Just wanted to make a quick update on another main character we've shown before. Our robot KiGi. He is also currently going through animation changes but his general appearance is 90% there I'd say. We're suckers for robots with TV heads who wear jackets. Chris Priestman just published an interview he did with us! For those of you who don't know him, he writes for various gaming websites (Siliconera, Killscreen) and is behind the most excellent WarpDoor, you should really check it out if you haven't seen it. Check out the ARTICLE if you want to know more about HomeMake's sprawling cyberpunk city and how it reflects our connected world. Just posted three new tracks for HomeMake. I feel like these have come the closest to emulating that classic Samurai Champloo feel. I wasn't one-hundred percent sure on any of the three tracks, but I thought it was more important to get the music out there and receive feedback than to make sure they are absolutely perfect. With these three tracks I used a lot of instruments I hadn't used before and I've continued to work on layering the music and getting the mastering down as best I could. They are probably a tad repetitive, that is something I'll have to work on for the next track. Also, it should be noted that all the tracks on the playlist are works in progress and will likely all change by the time the game is out. 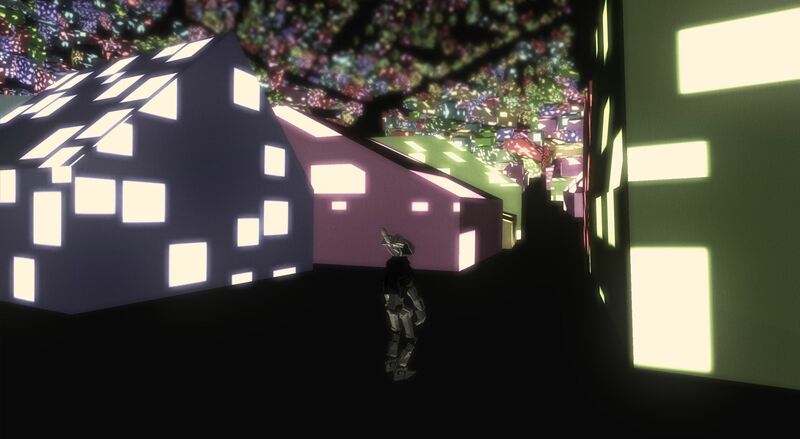 It's often hard for us to talk about the gameplay of HomeMake without referencing Majora's Mask at some point. The similarity between mask swapping/body swapping in the two games is hard to ignore. 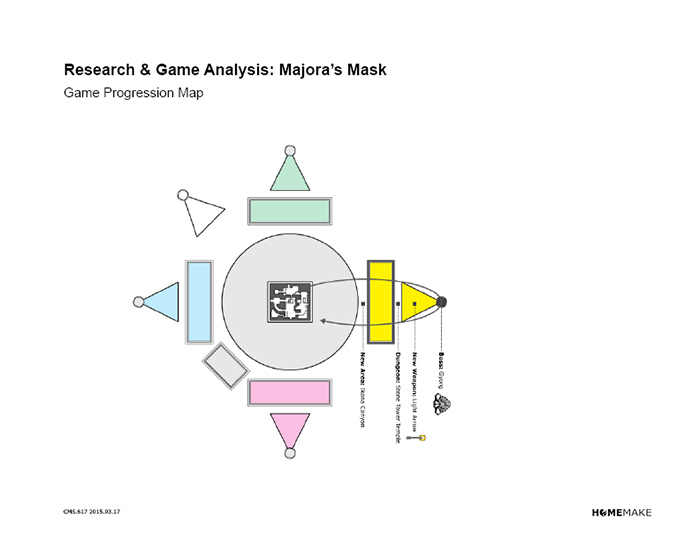 As part of a research study we revisited MM to see just how that game is laid out. 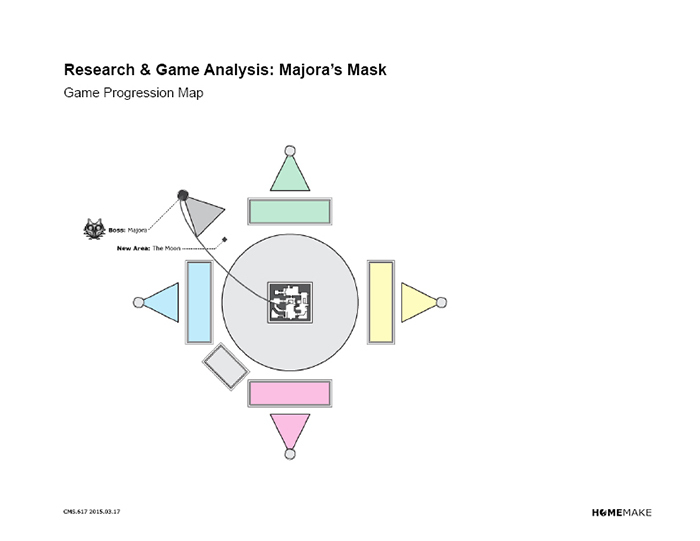 We put a brief presentation together with some diagrams for the game studio we're currently taking and thought some of you might be interested in the results. Alright lets get started! Majora's Mask! These next series of images are of the same map but looking at how the game grants access to various parts as you progress the narrative. In the tutorial section, you're limited to the hub world of Clock Town as it teaches you general controls, introduces platforming and interaction with the environment and NPCs. You're given two tasks, find your stolen ocarina and recover Majora's Mask for the mask salesman. By completing the first of these two tasks, you complete the tutorial, opening up the larger world outside clock town that then allows you complete the second task, finding Majora's Mask being the bulk of the actual game. I liked that they introduce to primary objective of the game right at the front, and by the end of the tutorial, you have the means to do it. Generally speaking, MM introduces each new section of the environment the same way. You play the song of time, reset the day and head in one of the cardinal directions. At this point, you have access to a new area, the first being Southern Swamp. Upon entering you're presented with a mini quest, a fully closed side story that takes places in this area alone. In the Southern Swamp, you have to help the Deku princess. By actively engaging in this mini quest, you gain access to this area's dungeon, a place you need to go anyway for the main story. In standard Zelda fashion, you then gain an item in this dungeon that allows you to solve its puzzles, defeat the boss, and return. Upon your return, however, you reengage with the mini quest you originally started, resolving any loose ends. Then finally, you play the song of time, and reset the day. As you'll see below, this arrangement is then repeated in each subsequent area. What really gets me about this organization is that MM is able to layer multiple characters, each with their own unique story, into the greater narrative without forcing them to play a part through the whole thing. By entering each area, you engage in their struggles, help them, and find resolution. You complete a full story arc in each new area that exists on a much more personal level than the tale of world destruction told throughout. After completing Southern Swamp, you gain access to Stonehead and the cycle repeats: New Area -> Mini Quest: Help Gorons -> Gain Dungeon Access -> New Weapon: Fire Arrow -> Defeat Boss -> Resolve Mini Quest: Help Gorons. By incorporating these short stories into the greater narrative MM enforces the idea that these masks are not just items, but people, people you should care about. You’re literally wearing the faces of people you meet along the way who have died and failed their journey. Their journey becomes yours, making you much more invested in the mini quest of each area. Same structure here as well, except this time with a brief stop at Romani Ranch, a completely optional area aside from getting back Epona in order to gain access to Great Bay. Everything is expertly layered so that you only gain access to new areas after acquire new powers from the area before. The last major area of the game is a little different in that you don’t receive a mini quest to complete. At this point you have all the transformation masks. 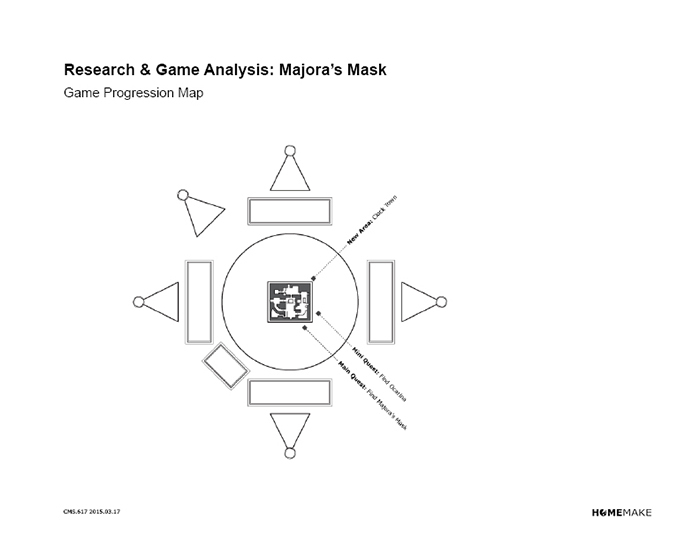 They could have easily put in a quest that didn’t involve a new mask but instead they left one out and focused on designing the level in such a way that you must now negotiate the 3 masks you’ve previously mastered in their respective areas. 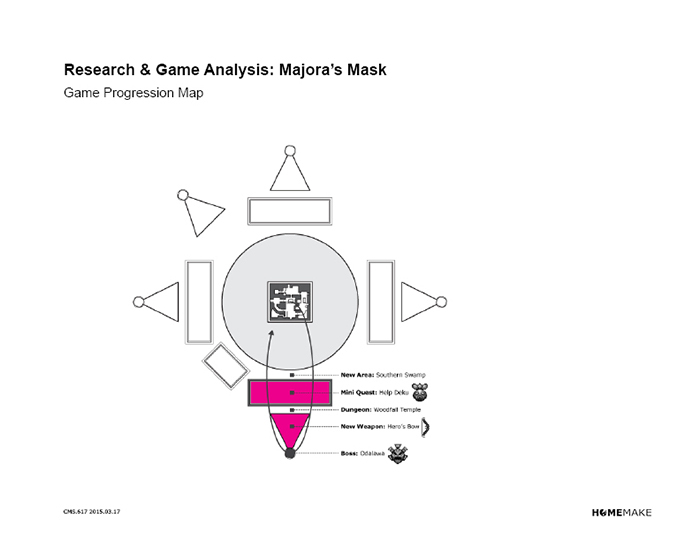 If we consider the other areas tutorials for each mask, this is now where the real game starts. Then at long last, once all areas are conquered, you gain access to the moon where the final battle takes place and the main quest is completed. 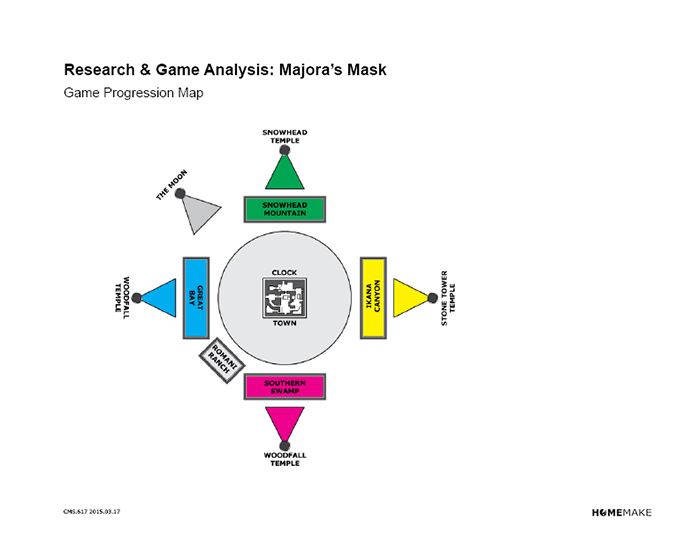 This diagram is a summary of the entire game struction of MM as you progress through each area. It starts: New Area -> Acquire Mask -> Mini Quest involving Mask -> Dungeon -> New Weapon to solve Dungeon -> Mini Quest resolved -> Restart. Now it has been awhile since I’ve played MM but I always remembered the extra masks playing more of a role in the gameplay. This is not actually the case, however. Of 24 wearable masks, only 3 are required to complete the game. Three! That means every other masks is completely optional and there for your own enjoyment. A way to expand the world of Termina should you go looking. These 5 masks at the top are boss masks. They are unwearable but necessary to complete the story. 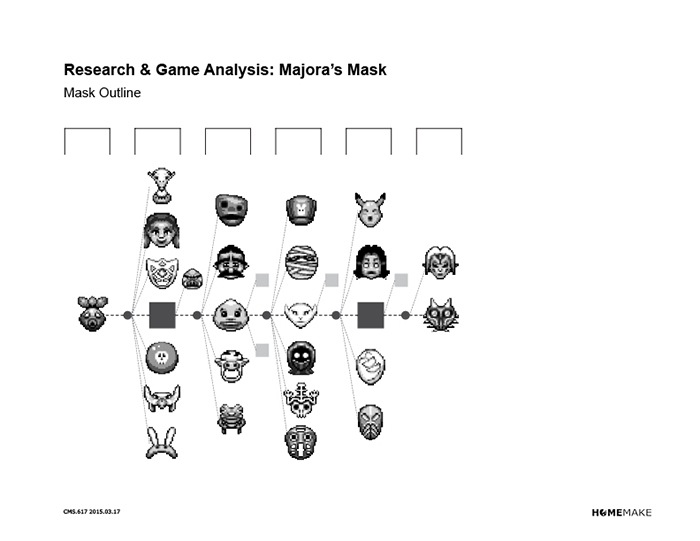 With so much optional content, you might ask why even bother getting all the masks? I mean, some masks barely do anything. The Bremen Mask allows you to play music and have baby birds follow you. You use it once, just to get the Bunny Hood, and all the Bunny Hood does is make you run slightly faster. 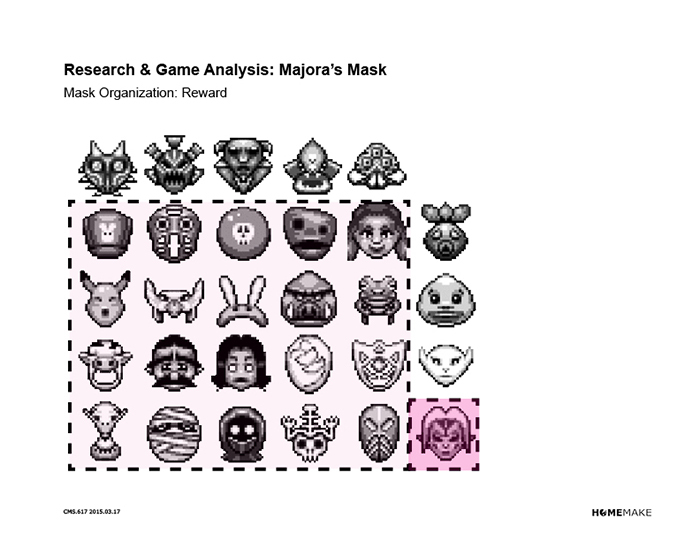 Now, I personally don’t think you need to incentivise players to get all the masks, learning about the variously characters of Termina as you collect them is enough of a reward in my opinion. 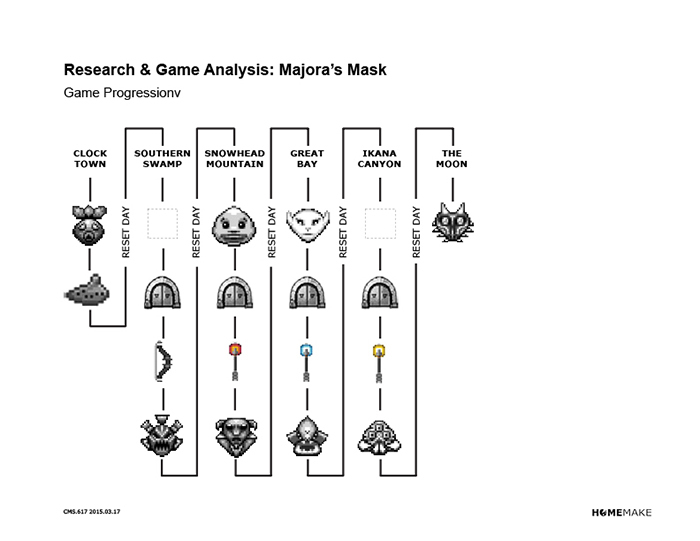 But what I thought was very smart was how you collect the last transformation mask: The Fierce Deity Mask. You need all 20 optional masks in order to get it. This is great because not only is it rewarding a dedicated player who actually took the time to find everything, but it directly affects the gameplay of the final boss fight. You leave the game feeling like a total badass and it makes you feel even more invested in the story in a strange way. By this point, you should be very knowledgable of everyone’s struggles in Clock Town and you should be very invested in their lives. The Fierce Deity Mask is essentially the struggles of everyone you’ve helped wrapped up into one mask. 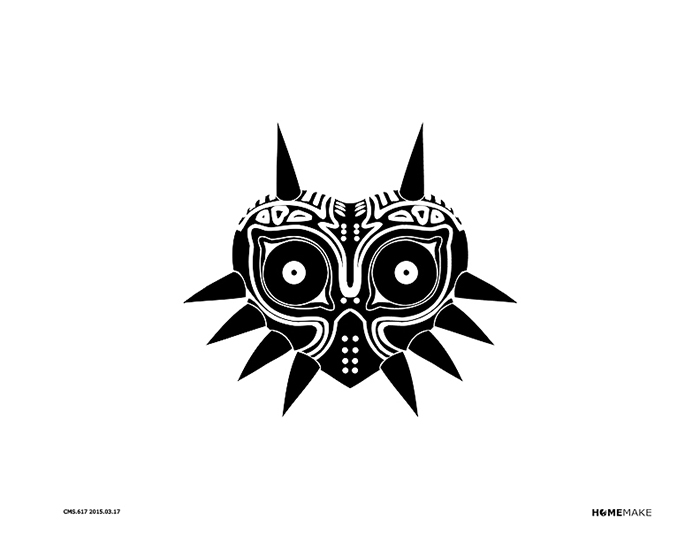 By dawning the mask, you realize that your victory over Majora is no longer the simple task of retrieving the mask for the mask salesman, but by doing so you’re saving all the people you’ve encountered along the way. It’s one of the most poetic uses of optional content I’ve ever encountered. I know this post is quite long but let me just wrap things up with a few more diagrams. The one above is showing overall game outline of MM. The dark gray blocks being mandatory elements the light grey being optional. The gain is actually quite linear if you factor out the optional content. 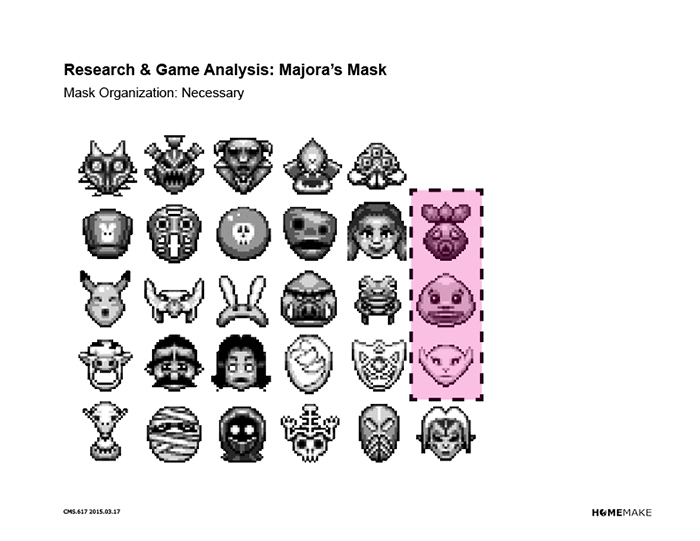 The same chart from above but this time with the masks in place. 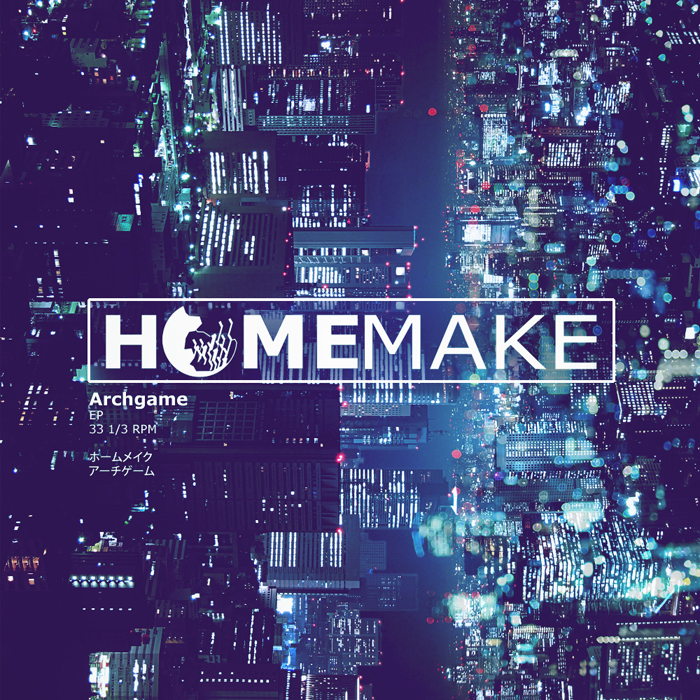 Coming back to HomeMake, we don’t want to unlock portions of the city in a similar way to MM, so we’re looking for something a little less linear. On the left is how our game is currently structured in comparison to MM. 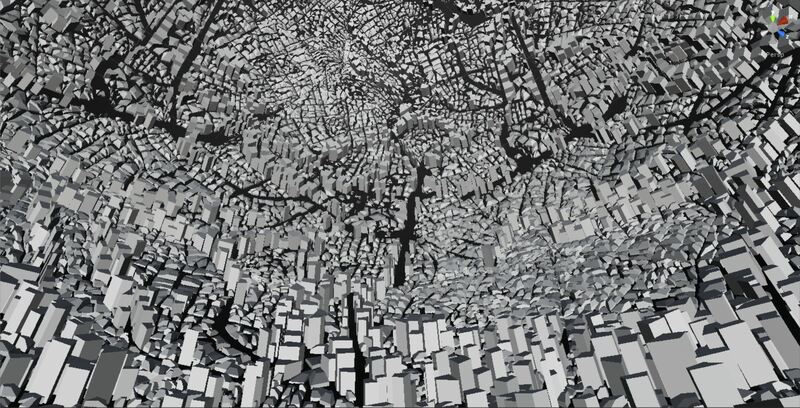 We want to open the city up to the player as soon as possible and allow them to explore at whatever pace they see fit. As you unlock various bodies and go through mini quests of our own, more and more of the city will be unlocked. Studying MM turned out to be extremely fruitful and we look forward to implementing some of their best strategies. Apologies for the lack of posts lately, midterms kicked in at school and swiftly transitioned to end of the year project preparation. 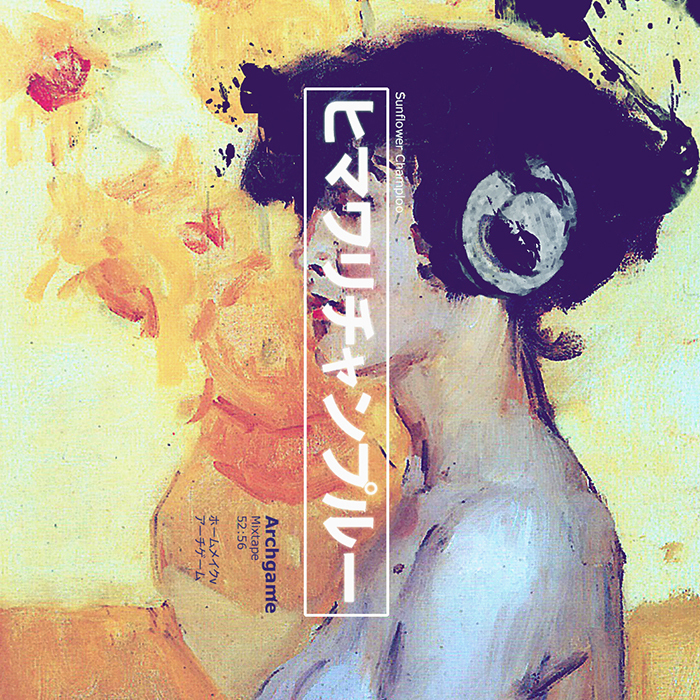 I did however have a chance to put together a conceptual music mix for HomeMake over spring break featuring (of course) nujabes, tsutchie, force of nature, dj okawari, thomas prime, blue in green, and plainsong. Enjoy! I'm honestly shocked this DevLog doesn't have more posts. On top of looking gorgeous, the documentation of all the behind-the-scenes research you guys have been doing is mindblowing, and incredibly interesting. I'm loving all of the posts coming from you guys! Thanks FK! We'll try and keep posts more consistent in the future, although knowing how finals goes, things could get pretty patchy. Just tweaking the character controller (previously we had used animations to move, then transforms to move, and now we have settled FINALLY on the character controller). On the previous two schemes, the gravity worked fine, this gravity works relatively the same, but for some reason the character is sliding. In the pic you can see the two different vectors I've tried to use for the character, one is the surface normal and one is the vector from the center, both have similar results. I made a bootleg solution by increasing the max move distance to 0.05, and it works for a bit, but eventually starts sliding, however it works well enough to start testing level design so hooray! I'm also going to begin implementing the audio mixing vision we've had since the beginning now that we've got our hands on that sweet Unity 5! This is the part of the project I'm the most excited about. Just got our audio concept implemented! A lot of people have been really into the music associated with our game, and while we've been posting single tracks on soundcloud (which you should kick back and listen to right away if you haven't! ), our real goal with the music has always been about mixing. Luckily, Unity 5 has super awesome audio, including a mixer that allows one to assign tracks, with each track having the ability to be controlled and effect independently of the other audio as well as sit/mix together with the audio in it's entirety. 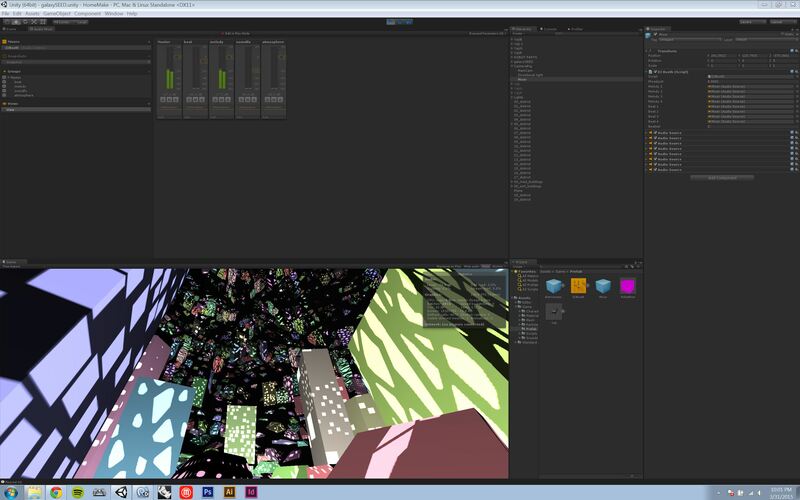 This was a big reason we jumped to Unity 5, and it was totally worth it. We'll post a video soon showing how the audio is working, but for now, there is a melody correlated with each character's perspective and each part of the city has a unique beat, so as the player moves around and switches characters there is a constant mixing of music. Still trying to tweak the gravity to perfection, it is kind of ridiculous how much it has changed just by switching from the transform to the character controller. This past weekend we were extremely busy/productive for our alpha critique in class this past Tuesday. This was great as it pushed us to tighten up a lot of things in the game; we will likely be making a new gameplay video soon and posting so stay tuned. The actual presentation in class went great, we asked for one of our classmates to volunteer and try out our tutorial (we had done play testing before, so we had already altered it considerably), and we were pretty happy with the progress she made and the things in game she latched onto. We are going to continue creating more gameplay for the coming two weeks as we have a Beta due in two Tuesdays. In the meantime, now that we finally had some tutorial/gameplay flushed out, I was able to take a second and step back to some of our ideas on how to push the urban form using architecture as precedent (no one has even attempted to guess any of the buildings!?). Here is a quick first stab, I'm aiming to get at least two more urban form models done for tomorrow as I had a surprise day off of work at the library. To see the sketches I'm talking about, refer to reply/post #20 (I'm starting from the top and will likely work sequentially unless inspiration says otherwise). Today I was able to add four different building types to the game (with the intent that each one will have some sort of gameplay repercussion). The first is a house type that has a slopped roof, only certain characters will be able to scale the roof, who knows maybe we'll have to hide something in a chimney. The second architecture type was from the previous post. 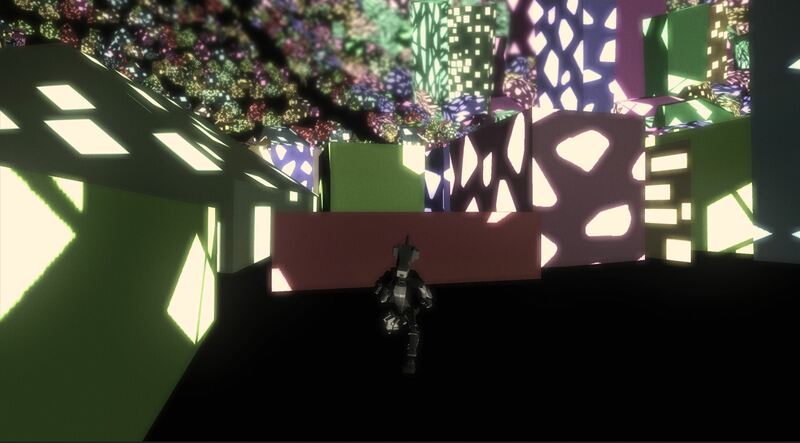 This will likely be one of the first architecture types the player learns how to traverse, a series of cubes scattered, which creates small alleys as well as potential jumping blocks. The next architecture type is a building that is composed of a series of stacked cubes with differentiated proportions. This creates varying ledges so that when the buildings are next to each other the player is able to platform their way to the top. The final building type is the most complicated so far. It is a tower that has varied protrusions rotated to different angles. 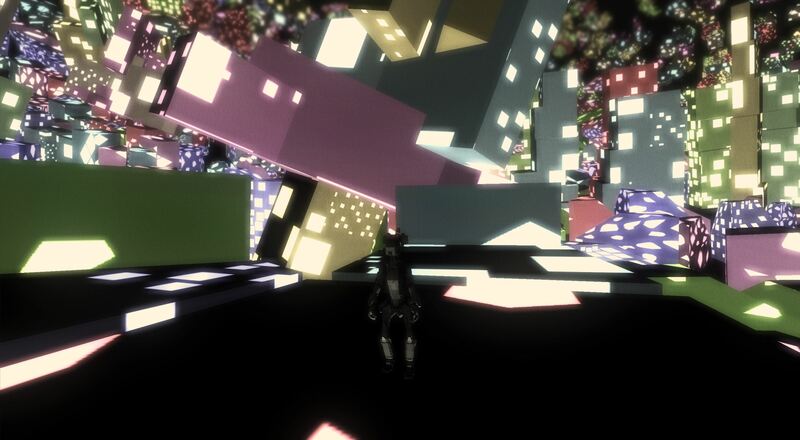 It is not as easy to platform on as the previous architecture, so hopefully it will inspire other means of traversal. Here is a shot with everything together so you can get a sense of scale. 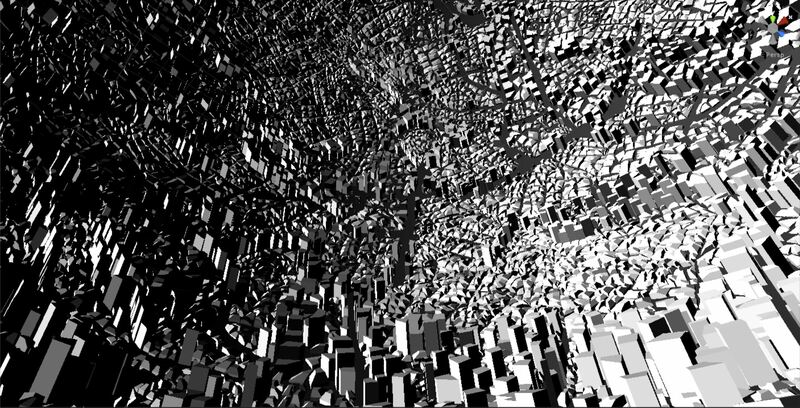 This is something we are still trying to figure out, unlike materialized architecture, there is not scale in a virtual world. After creating this different architectures, I was actually rather disappointed by their final appearance, I think it is time to dive back into the building material and start to differentiate that as well. I did have fun trying to platform my way up all the towers though, now it is time to design some puzzles that will utilize these new architectures. 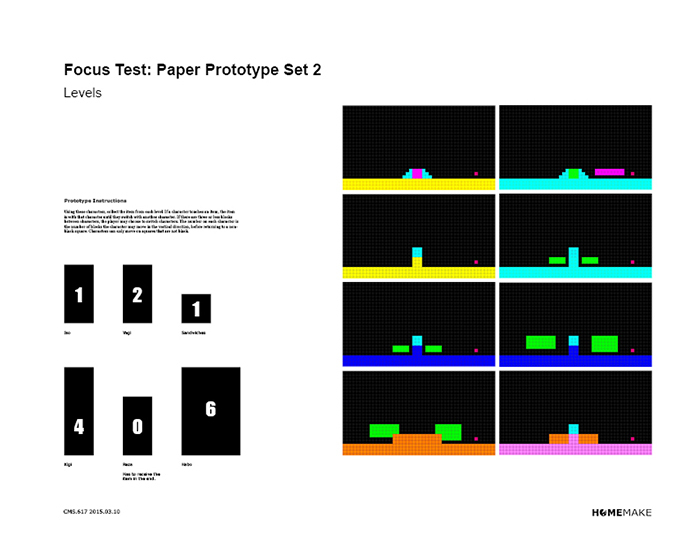 First off, I have to preface this by saying these are paper prototype game tests that we did what feels like forever ago, but the results came up in a dev conversation we were having today, so I wanted to make sure they were logged to avoid any confusion when we make future posts about these results and more recent ones. 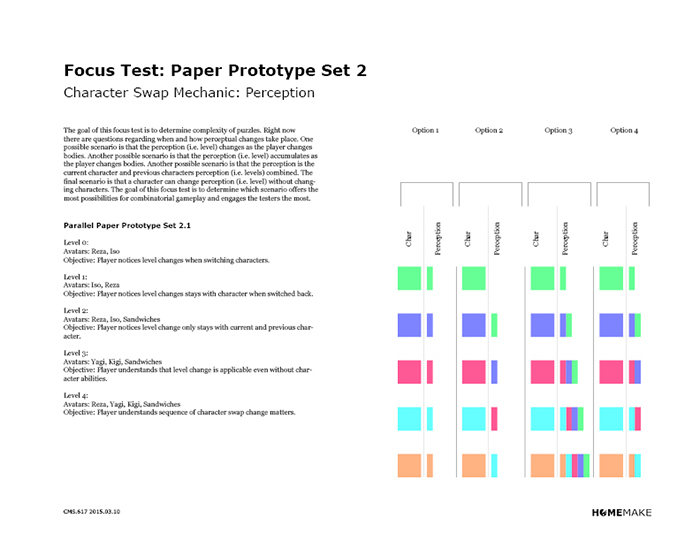 Hopefully other devs also find our method of paper prototyping helpful. 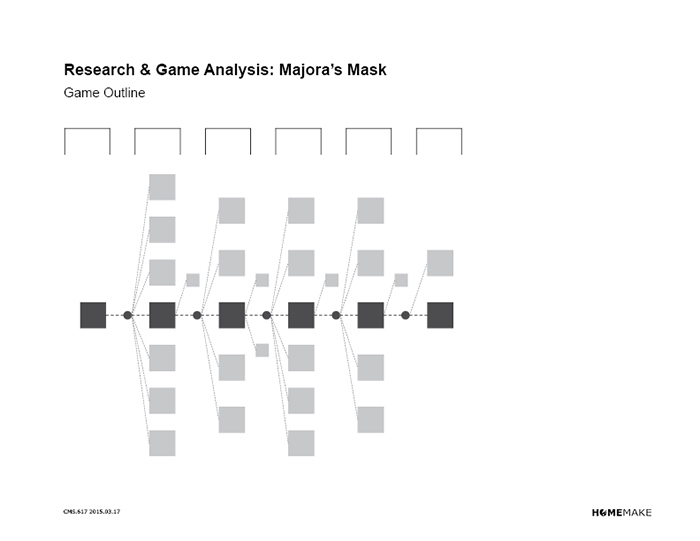 The goal of this paper prototype is to determine the character swap game mechanic. 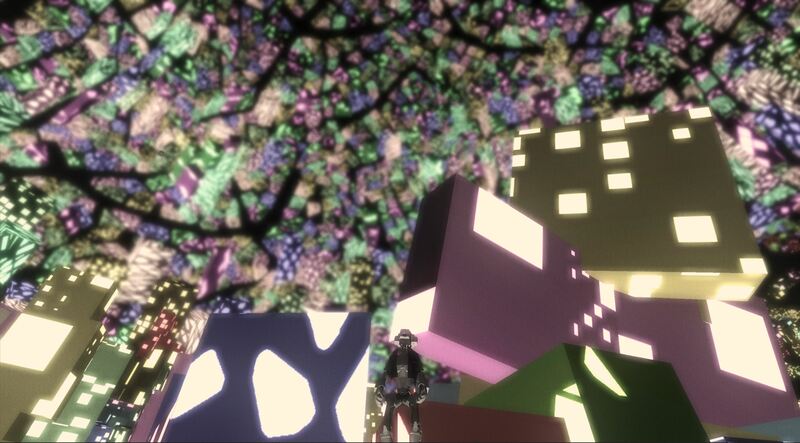 The first iteration will contain puzzles where the character leaves their body behind. 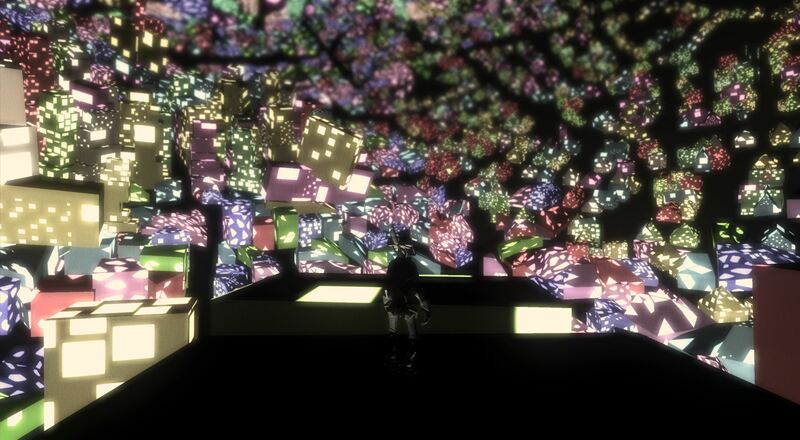 The second iteration contains puzzles where the character accumulates abilities as they connect with other characters. We outlined four different options for how we imagined the mechanic working: Option 1: Each character has a unique ability, Option 2: When a player swaps characters the abilities accumulate, Option 3: When a player swaps characters the character has it's inherent ability along with the previous characters abilities, and Option 4: When a player swaps characters they only have the ability of the previous character. On the left is a set of instructions for the game along with Avatars we cut out of paper. On the right are different levels which we projected onto a board so the players could use the paper avatars. 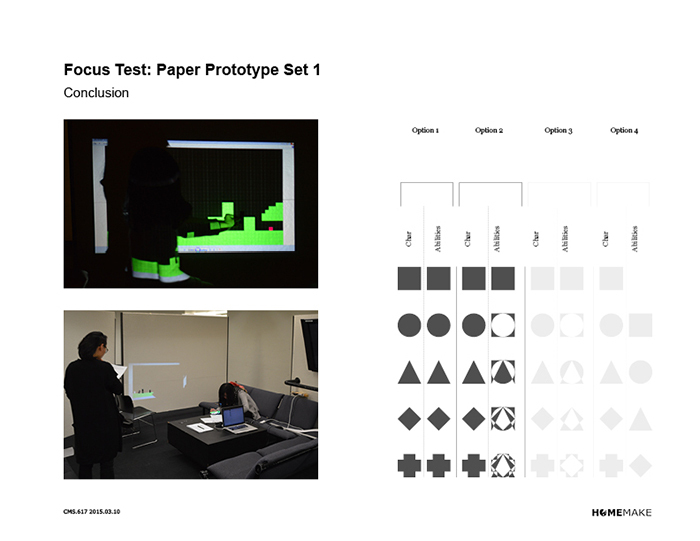 From the paper prototype testing, we decided on using both Option 1 and Option 2, with implications for the story and the mastery the player acquires as they spend time exploring the game's possibilities. 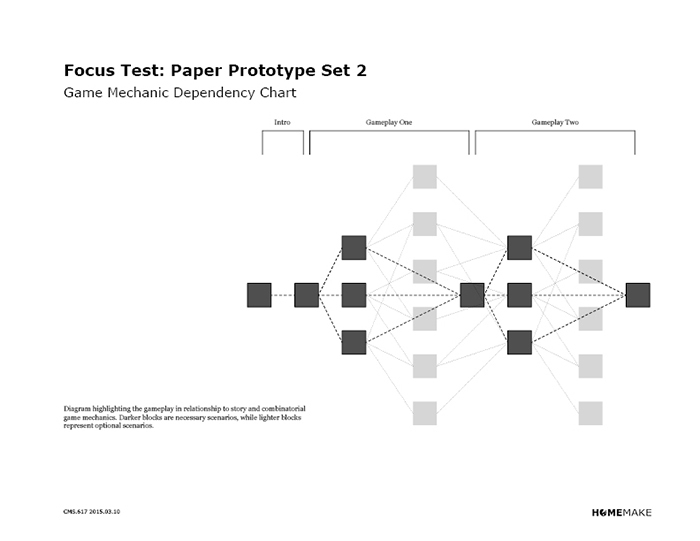 The goal of the second paper prototype test is to determine complexity of puzzles. Right now there are questions regarding when and how perceptual changes take place. One possible scenario is that the perception (i.e. 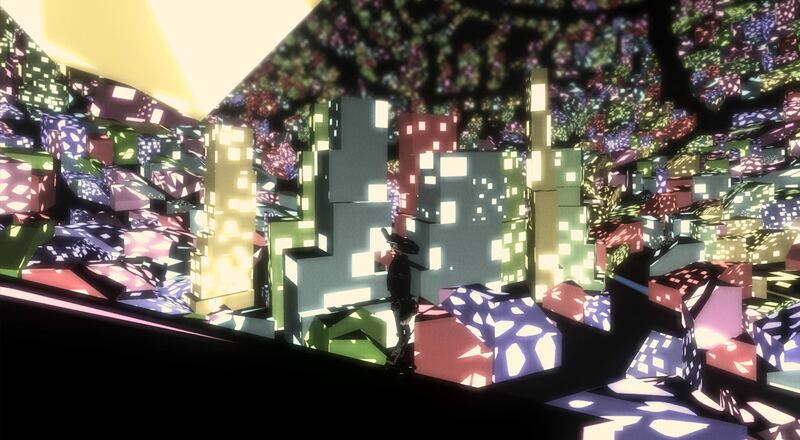 level) changes as the player changes bodies. Another possible scenario is that the perception (i.e. level) accumulates as the player changes bodies. Another possible scenario is that the perception is the current character and previous characters perception (i.e. levels) combined. The final scenario is that a character can change perception (i.e. level) without changing characters. 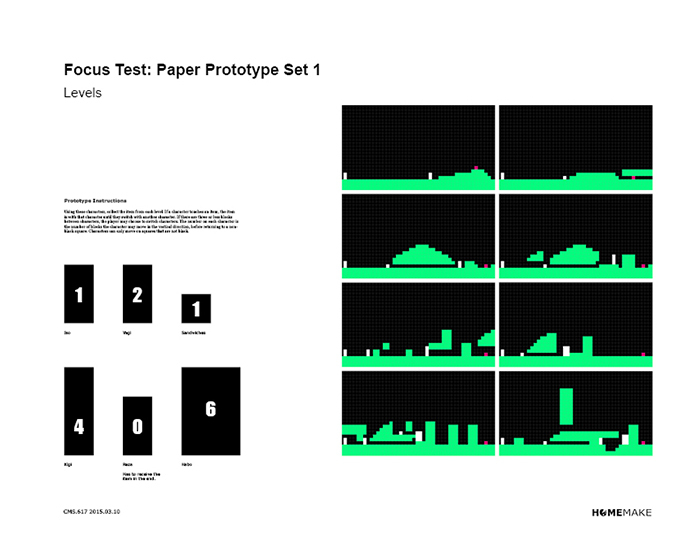 The goal of this focus test is to determine which scenario offers the most possibilities for combinatorial gameplay and engages the testers the most. Again we were testing against four options for perceptual swapping, which were similar to the four options from the ability swapping diagram: Option 1: Each character has their own perception, Option 2: Each character only has the perception of the previous character, Option 3: The perceptions accumulate each time a player swaps bodies, and Option 4: when a player swaps a body he has the perception of the current character and the previous character. 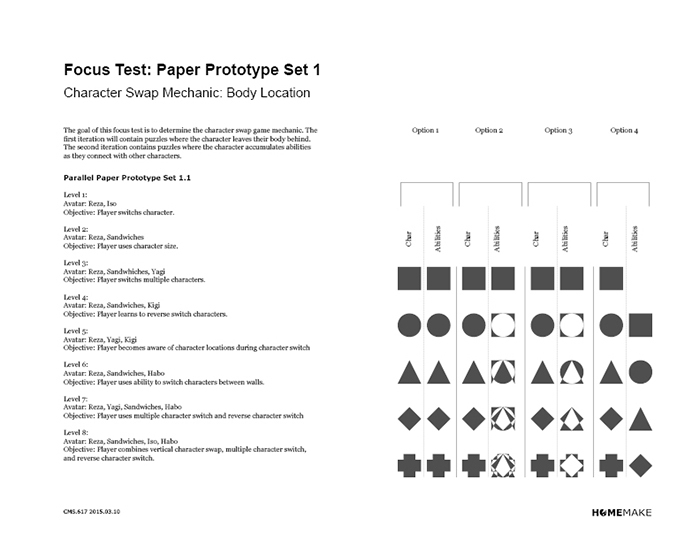 This rule set and paper prototype is almost identical to the first one, however we were controlling the level swapping as a way to augment the characters changing perception (with the ability to subsequently see new parts of the level, previously hidden without the perception change). Because we were controlling this a lot of players didn't realize that the level changing was indicative of a perceptual change, so in the digital game we made sure to implement a toggle so the player not only had control but instant feedback for perceptual shifts. 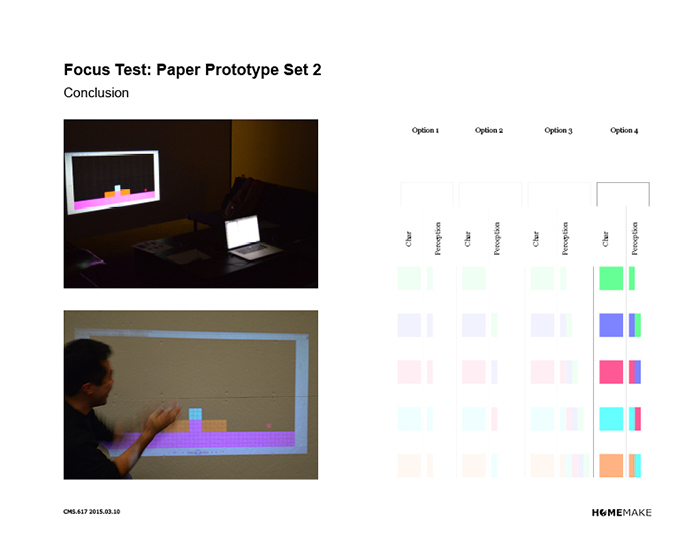 From the paper prototype testing, we decided to use Option 4 for the perceptual game mechanic. It was the only option that required the player to understand a swapping order and have the ability to control the perception. Basically, this game mechanic offers the most complexity with the same amount of parts. 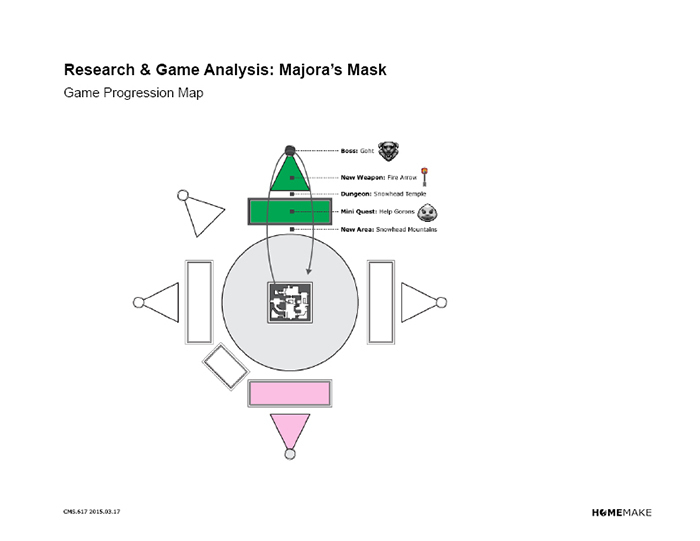 From an understanding of the game mechanics and their progression through the game, we were able to develop the above diagram. 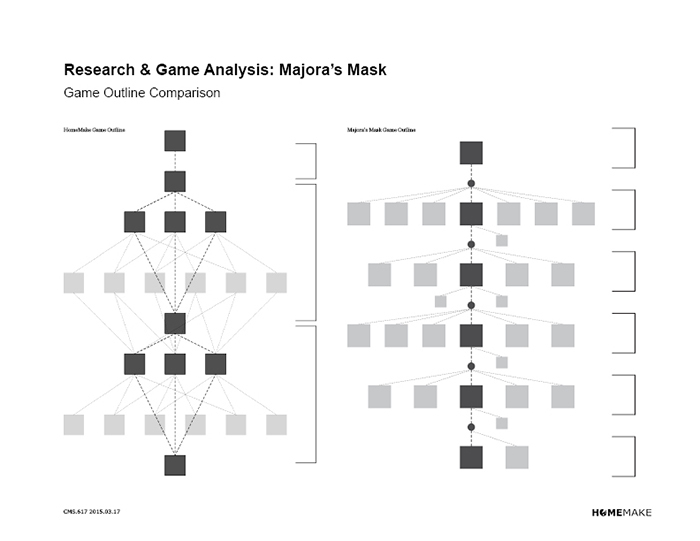 The diagram highlights the gameplay in relationship to story and combinatorial game mechanics. Darker blocks are necessary scenarios, while lighter blocks represent optional scenarios. For more on the diagram refer to post #29. 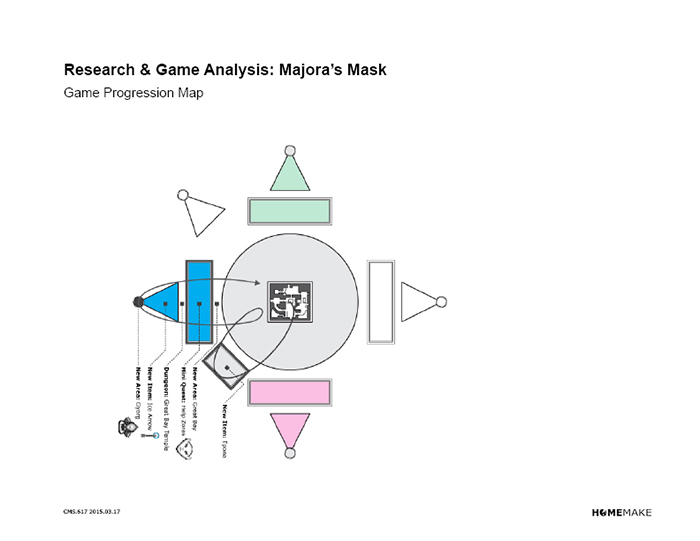 As stated in the beginning of the post, we have continued to develop this diagram to make a blue print for how game mechanics and puzzles will flow and develop during the game. 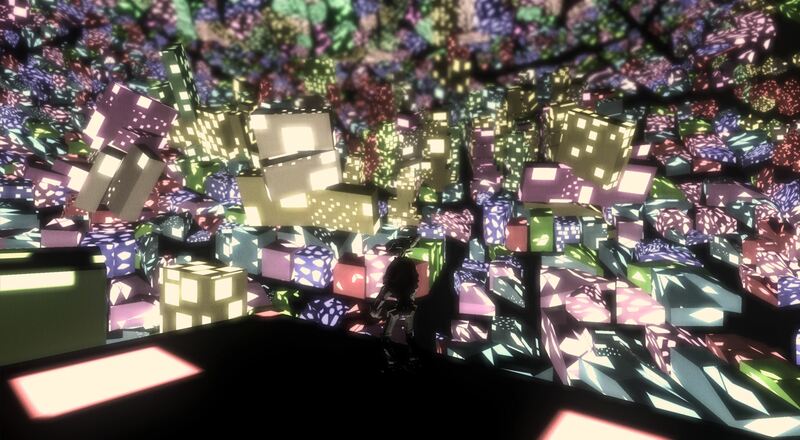 A big part of HomeMake is exploring the world through different characters; each character not only has a unique platforming ability, but also has a unique perception which will allow them to understand the world differently than other characters. The script works by adjusting variables and toggling a variety of image effects on and off to achieve the desired aesthetic for each character. Additionally there are events and items in the world which only appear when in a specific characters perspective. As the player progresses through the game they are able to combine and collect characters as they switch bodies, allowing for one character to have more than one perception. I'll have to put some gifs together, because a number of these perspectives become really apparent with movement, but for now we'll have to settle for these images. Right now the transitions between perspectives are a simple toggle, although the ambition is to provide a smooth transition between perspectives. Additionally, the camera will not remain in a fixed position but will be dynamic in relationship towards the actions and the setting. The animations for all these characters has always been a challenge. 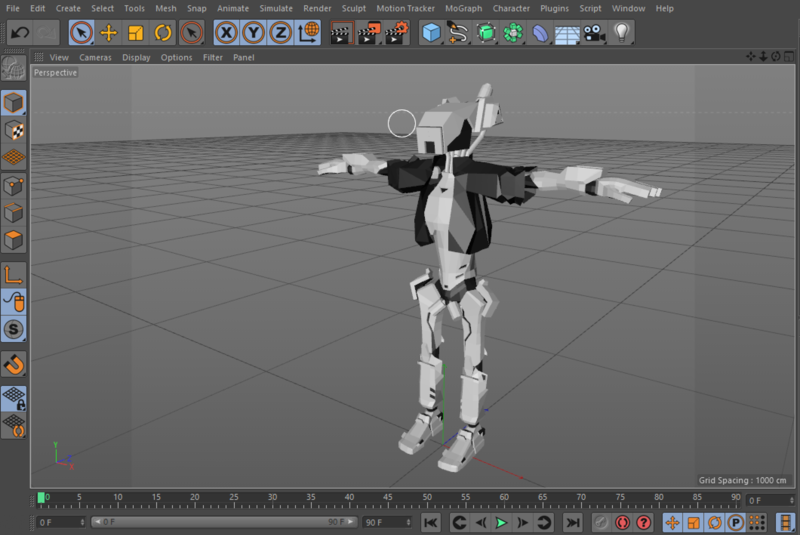 When this project first started I was only marginally comfortable with animating characters, let alone so many of them. After many, many trials and errors I'm glad to say I've established a decent workflow for pumping out animations easily. I'm fully convinced that in order to be a good animator becoming a monk and training in zen meditation and patience is a key part of the process. 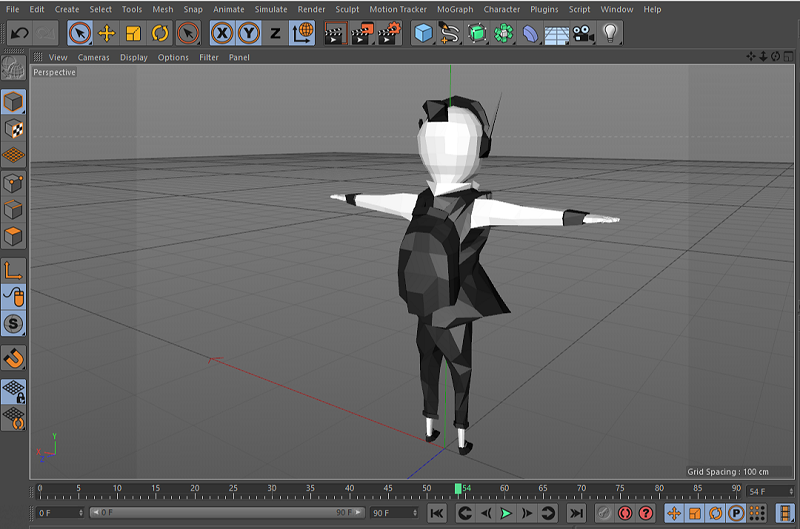 There's just so many steps in animating a 3D character where it can go wrong, you sprite guys have it easy. I'll make a post soon about all these steps but for now enjoy some recent animations for a character we haven't shown in a while: our visually impaired fox Sandwiches! 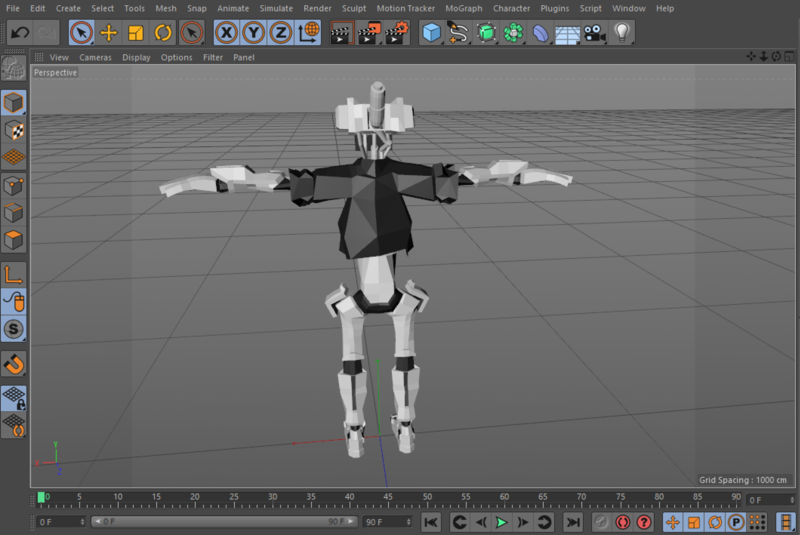 Just the bones for the run animation. Idle state normal. We still have to do some tests in switching between idle states but this is the standard animation we'll work off of. Sandwiches has some buff smell receptors. A lot of this puzzles will involve being a smell detective. Finally, the working rig, just messing around. Our camera is controlled by transforms, so we've had an issue of it going through a variety of things, most notably all the buildings that compromise our world. We couldn't simply attach a collider as the transform would override this. Instead, we opted for a method that checks if the camera is within a building or not. 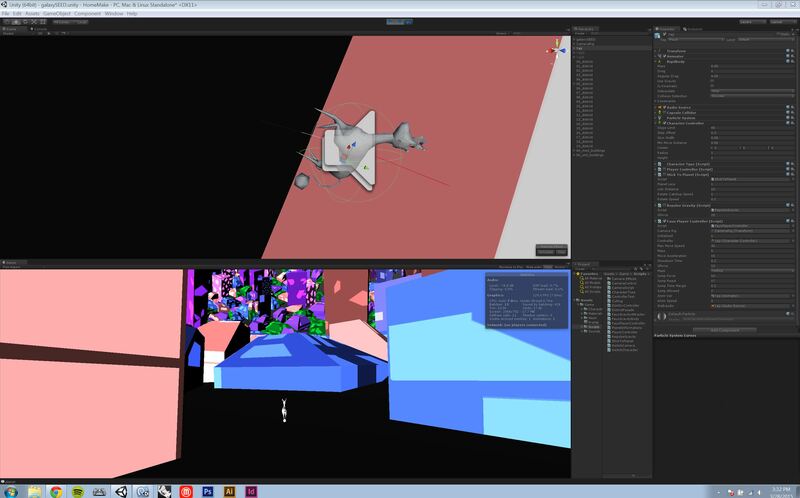 To do this we created two vectors (pictured in blue), one from camera to the player and one from the player to the camera (we needed two vectors for when the player went around corners or stood in front of a building, the two vectors catch these situations). 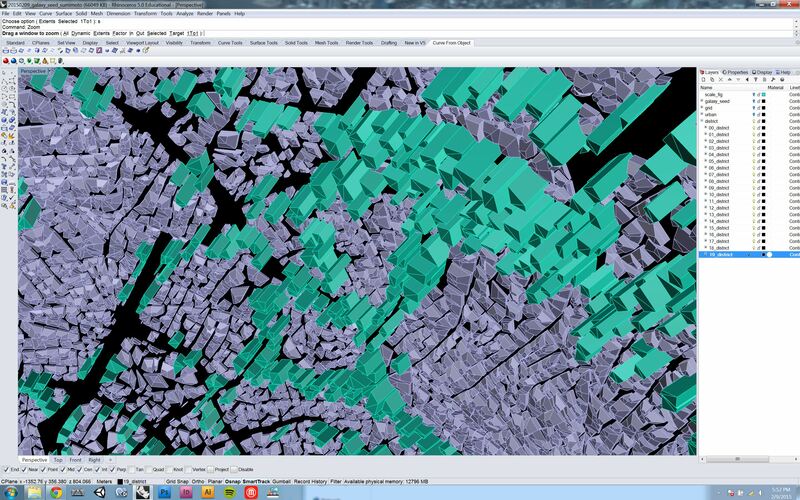 When the blue vector does come into contact with a building surface (tagged as such), it creates an offset based off of the surface normal, shown with the red vector. The actual camera position is then set by the green vector, with a lerp to prevent a sudden jump between the two. This camera system allows for the camera to not only avoid going into buildings, but will help the camera focus on the player when exploring through narrow alleys and walking along the ledges of buildings. Currently the camera follows the player but keeps the orientation set by the player, after some play testing it appears that having a sort of Z targeting (like in Ocarina of Time) would be ideal and to have this as the default camera. (Also I captured these GIFs using GifCam, it was super easy).